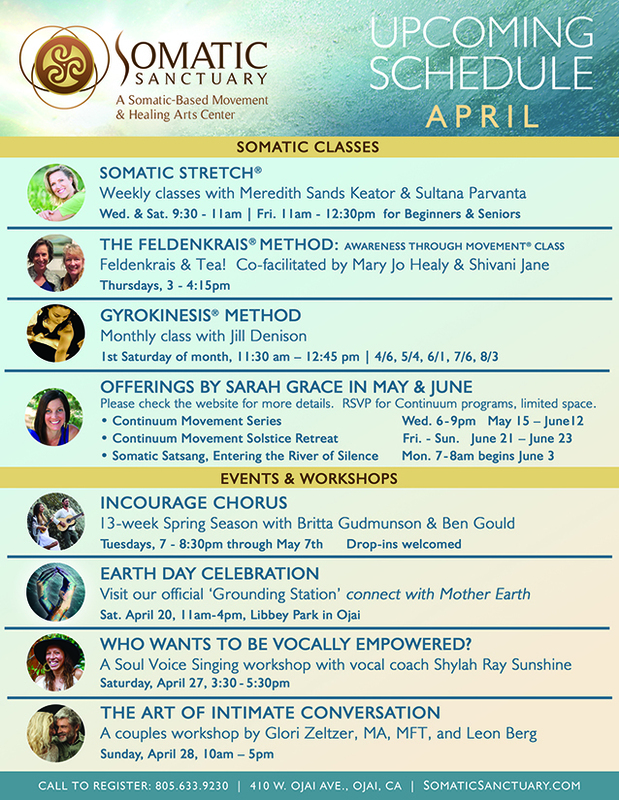 Download the schedule flyer for April here. 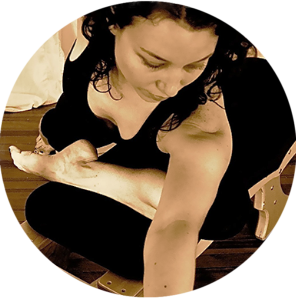 Improve your flexibility without strain, create greater movement and ease. Need some extra attention? Gain insight into moving with ease and freedom. 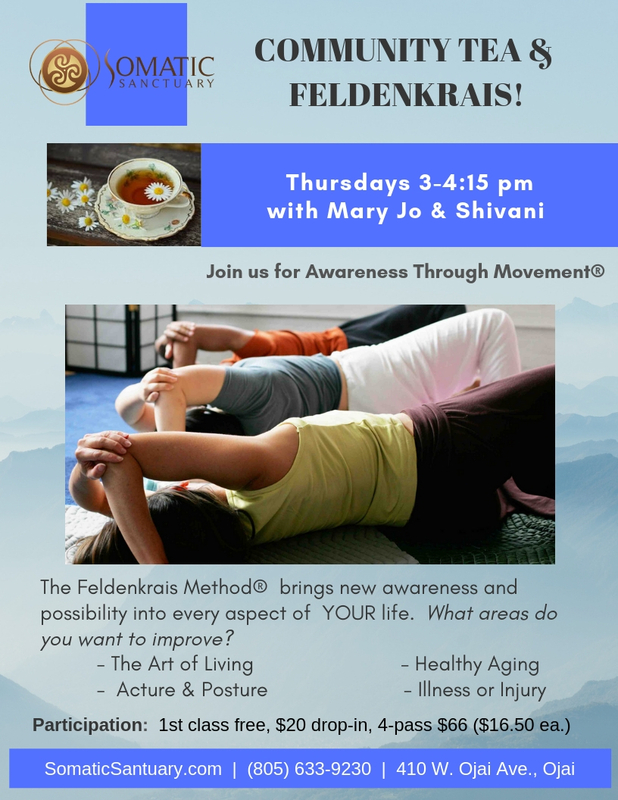 The Feldenkrais Method brings new awareness and possibility into every aspect of YOUR life. What areas do you want to improve? 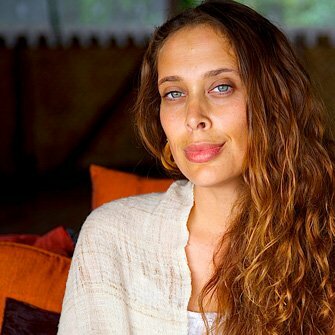 Come learn this unique method to improve YOUR life. Lessons use slow mindful movements that enhance coordination, strength, balance and flexibility. Change limiting habits and improve stability and confidence to move easily in all directions. Enhances personal growth and emotional and physical well-being. Class starts with community tea followed by the weekly lesson. Drop-ins welcomed. 1st class by donation. Drop-ins welcomed. 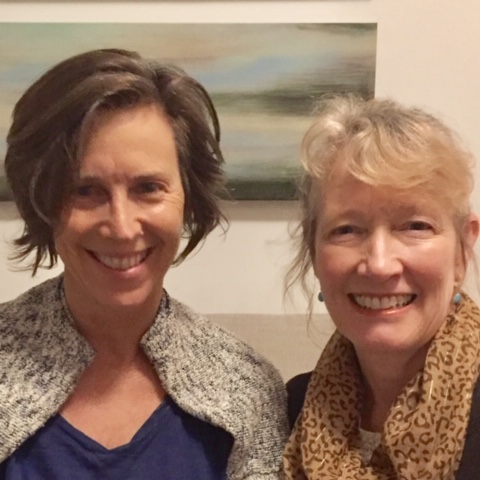 Sarah Grace, founder, has invited Jill Dennison, master teacher of the GYROKINESIS® Method to the sanctuary. 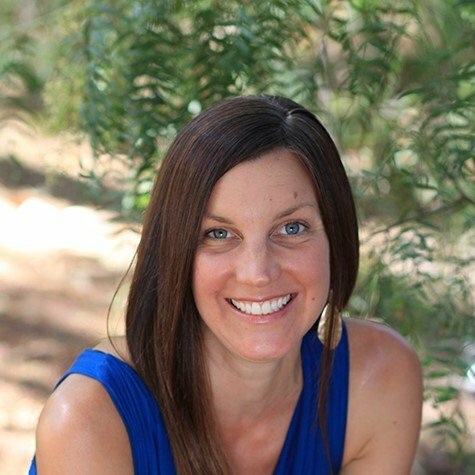 Sarah truly believes this modality opens up the spiralic intelligence of the body clearing pathways that can otherwise constrict from pain or trauma. 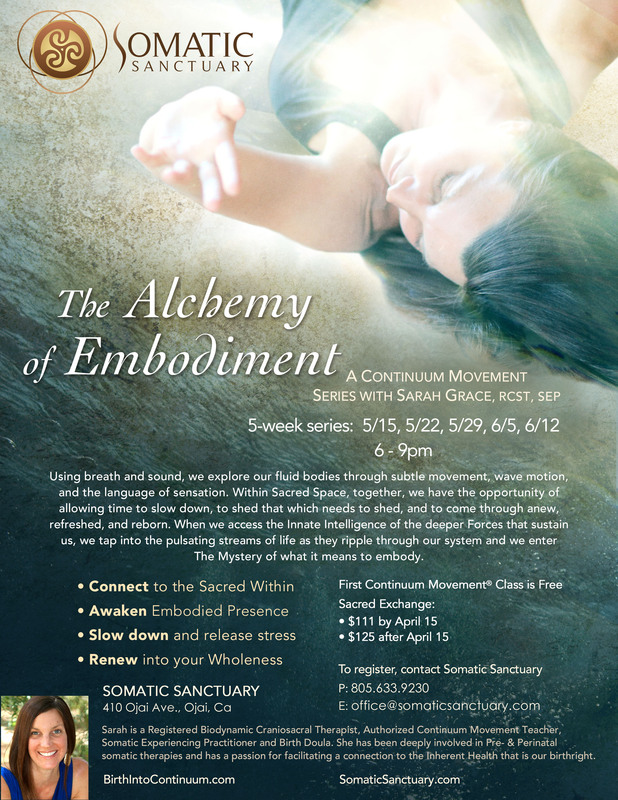 It is a perfect adjunct to Continuum Movement, Feldenkrais and somatic trauma therapy. 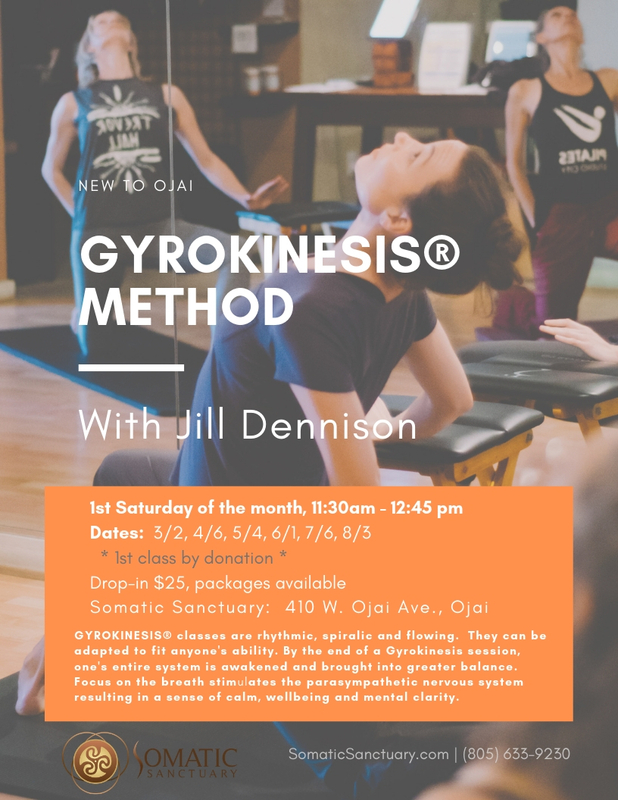 The GYROKINESIS® Method gently awakens the entire body, opening energy pathways, stimulating the nervous system, increasing range of motion, & creating functional strength through rhythmic, flowing movement sequences. Mat & chair class. All ages & fitness levels welcome. 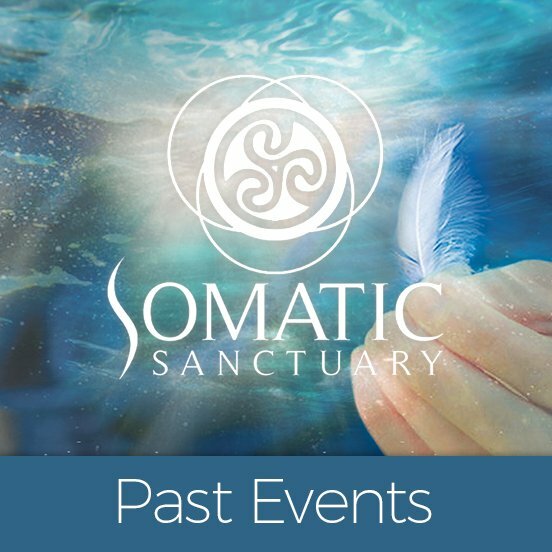 GYROTONIC®, GYROTONER®, GYROTONIC EXPANSION SYSTEM®, GYROKINESIS® are registered trademarks of Gyrotonic Sales Corp and are used with their permission. WHO WANTS TO BE VOCALLY EMPOWERED? YOUR authentic Soul Voice is a resource waiting to be used creatively, boldly and compassionately. 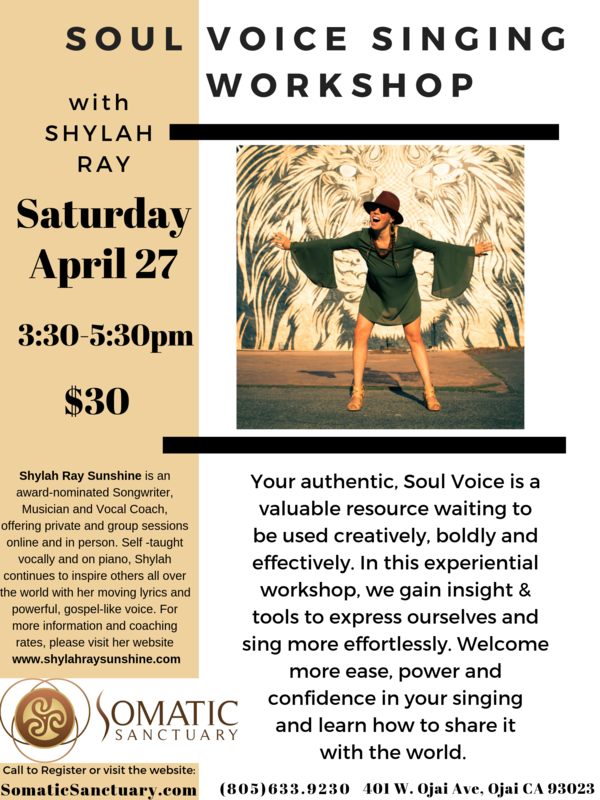 In this experiential workshop we gain insight and tools to express and sing more effortlessly. Welcome more ease, power and confidence in your singing and learn how to share it with the world. All ages and experience levels are welcomed. Have you been longing for something different in your relationship? Would you like more intimacy? 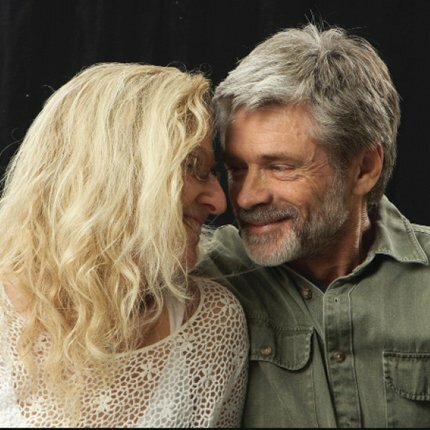 Enjoy a lovely day with your partner while learning tools to deepen your love. Raise your voice, vibration and spirit in a non-audition community choir. 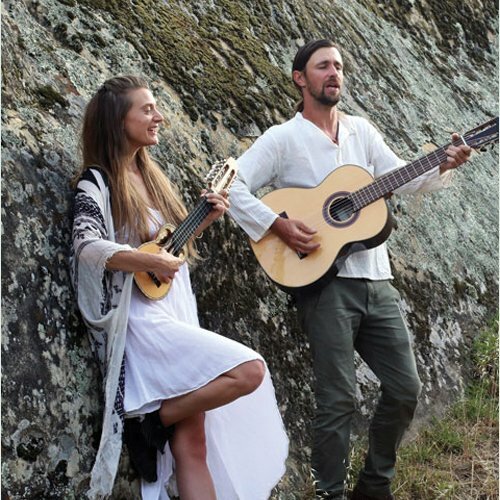 Songs are taught in the oral tradition, no experience necessary. Singers & recovering “non-singers” are welcome! Concludes with benefit concert. 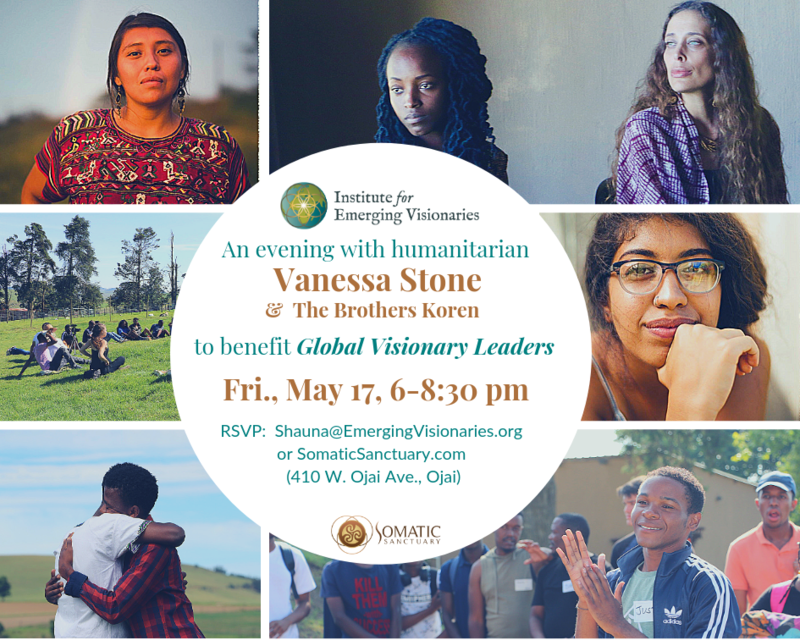 Somatic Sanctuary founder, Sarah Grace, invites the community to gather together to celebrate and support our Global Visionary Youth Leaders and learn about the work and service of Vanessa Stone and her passion for supporting young leaders worldwide. The Institute for Emerging Visionaries serves as an incubator for young leaders who are committed to actualizing their visions in service to humanity. 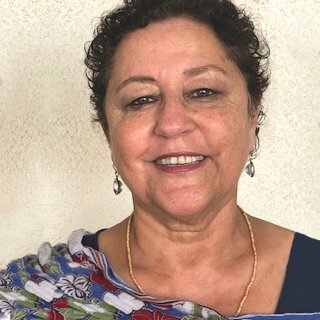 Through facilitation training, self-inquiry, trauma healing and heart-centered leadership training; The Institute for Emerging Visionaries is dedicated to helping provide the tools and resources necessary for youth from around the globe to create experiences in which diverse groups of people can gather with the intention to heal, connect, serve and discover the unique gifts they have to share with the world. 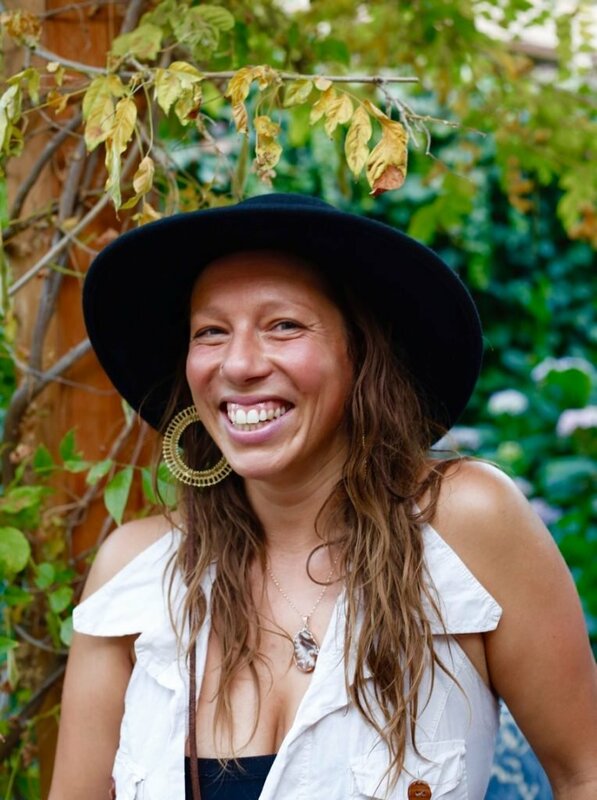 Join us as we gather for a day of remembrance, self-inquiry, life giving authenticity and personal revelation sourced from within. Together, we will explore and honor what is most authentic and alive within YOU on the spiritual path that is YOUR life. This is an invitation to return to the simplicity of living awake, engaged and in resonance with the opportunity of a human life and all that it offers the soul. 10% of all proceeds go to the Institute for Emerging Visionaries. 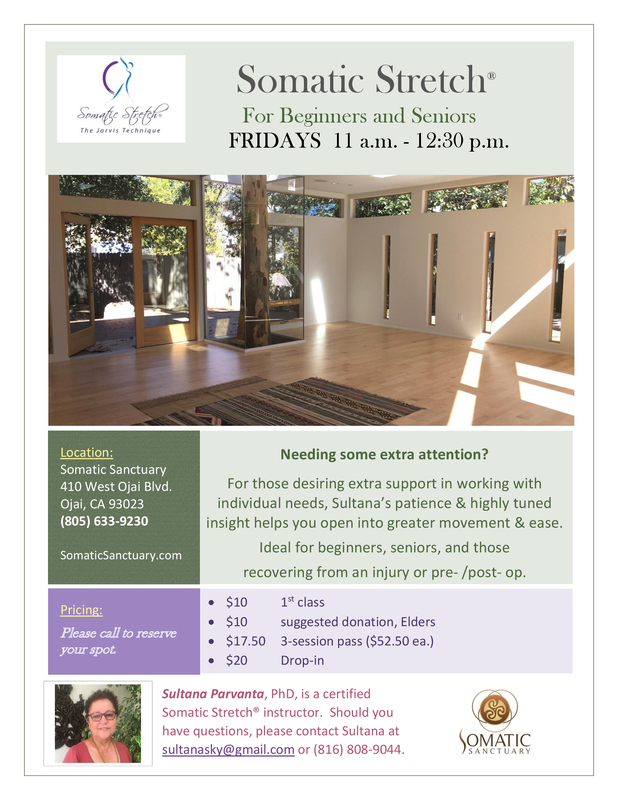 The retreat will be in Sanctuary/Studio. Mats/ backjacks/ poufs/ blankets and folding chairs available. Bring anything else to make yourself comfortable.Offer purified water. Okay to bring light snacks and a beverage container with a lid. We are an ADA accessible facility.